Visions Festival this morning unveiled a new wave of acts for the day-long summer event on 2nd August. 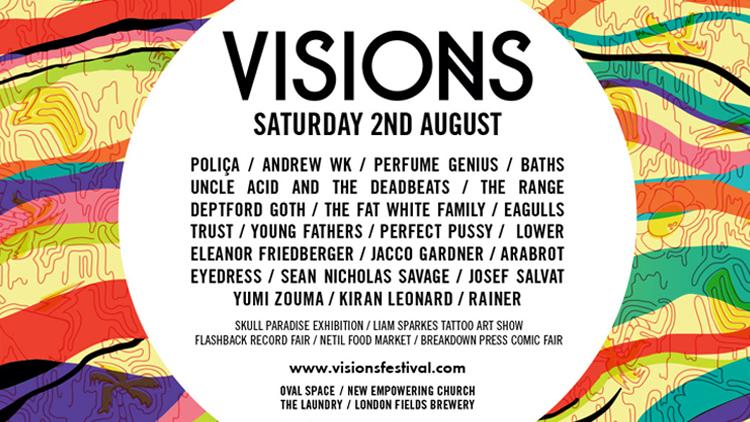 The likes of Perfume Genius, Uncle Acid & The Deadbeats, Deptford Goth, Trust, Yumi Zouma, Lower, Eyedress, and more join the likes of already announced Andrew WK, Polica, Eagulls, The Range, Baths, Fat White Family and more for Visions Festival 2014. PLUS! Skull Paradise Exhibition, Liam Sparkes Tattoo Art Show, Flashback Record Fair, Netil Food Market, Breakdown Press Comic Fair.